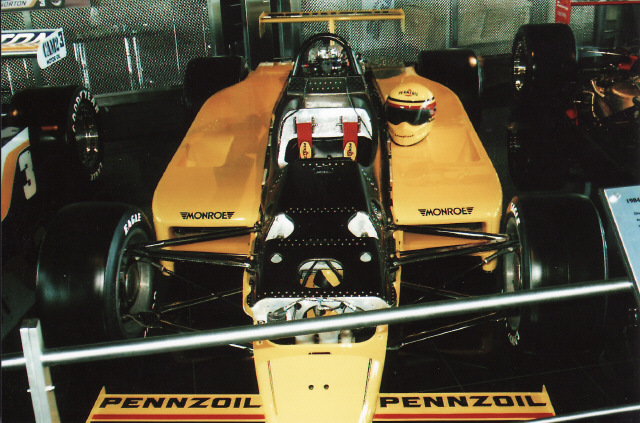 “Come celebrate 40 years of winning racing tradition at the Penske Racing Museum. Located at the new 41 acre North Scottsdale Auto Mall, owned and operated by United Auto Group, Inc. Staying at my brother’s ‘Housianda in Scottsdale, Miguel asked: “How do you know about that?” Even more humourous was the fact that it was just 10 minutes (approx.) north of his house. Entering the parking lot, Miguel spotted a brand new red Ferrari F430 parked outside; this must be the place, eh? After snapping what would become the first of many zillion pictures, (80) we sauntered over to view a “Fly-Yellow” 2002 Maserati Spyder parked next to a 2005 Corvette. The “Maser” was listed at a “kOOL $66.5,” marked down to ONLY $59,900.00. Turns out she was the receptionist for the flagship portion of the UAG Arizona (Penske) “Superstore” Auto Mall, the “Used Cars Dept.” We ended up having a pleasant 5-10 minute conversation with her as she sat behind her desk. Standing there while surveying the “Used” cars... She corrected herself by referring to them as “Pre-Owned Cars.” While she was raving about the Bentley they’d just acquired from New York with 17k miles on it, suddenly a sight totally unexpected jumped out at me, as I noticed a brilliant yellow car with twin black stripes on it! Is that a Ford GT, I asked? It sure is she replied... It’s even the preferred colour option; SHEISA!!! I wandered over to a lone black Ferrari 360 Modena, and then took a serious look at the Ford GT. What a FREAKIN’ AWESOME car! (Ford definitely hit a HOME RUN with this magnificent re-incarnation of the original GT 40!) As the aura of the Ford GT made me simply pay ZERO attention to the Aston Martin DB9 behind it... As it’d sound even better when we had to drive in behind a black Ford GT at Indy for the ’06 USGP; Aye Karumba! Then we meandered around two more “garden-variety” Aston Martin’s, a red Ferrari F355 GTS, and a black Lamborghini Gallardo along with a gaggle of four different Ferrari 360 Modena’s. Can you say: Oh What a Feeling! 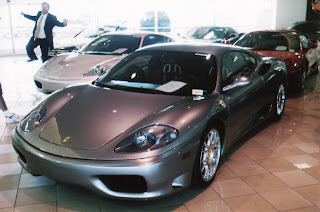 As Miguel took a photo of “Juan ‘O” the 360 Modena’s, a salesman entered the showroom. Turning around I noticed he was flaying his arms & legs, saying, “I wanna be in the picture.” When viewing the photo’s on Miguel’s Confuzer the following day, the salesman was caught fully in air doing a perfect Toyota “Oh what a feeling” jump! Finally we forced ourselves outside to gawk at the purple Bentley Continental GT. What a wild machine... (6.0 liter Twin Turbocharged V-12) Forlornly looking abandoned sat a “Nasty” red 2003 Porsche 911... The Porsche looked menacingly “slammed and ALL business!” And that was before we ever made it to the Racing museum - double SHEISA!!! Opposite the Sunoco McLaren sat Rusty Wallace’s 2005 “Last Call” Miller Lite Dodge Charger and ‘Pardenerin’ the Dodge was the 1963 Pontiac Catalina that Roger Penske drove to victory in the Riverside 250. What??? Roger Penske won a ‘RASSCAR race? Unbelievable! The center of the museum featured two rows of four racecars divided by the main aisle. Across from the Rusty “BARK at the MOON” Wallace (Stock Car) ‘Bomber sat the Norton Gould liveried 1981 Penske PC-9B, driven by Bobby Unser. (B. Unser’s 3rd Indy 500 victory) alongside is the bright yellow “Pennzoil Special.” The 1984 March 84C was piloted by Rick Mears. (Mears 2nd Indy 500 victory) Next is the first of five BAD HABBITZ (Marlboro) chassis. The 1993 Penske PC-22 which garnered “emmaLOe or ‘EMMO” (Emerson Fittipaldi) his second Indy 500 victory... And at the end of “Winner’s Row-1:” was the second banana yellow charger. The 1988 Penske PC-17 piloted by Rick Mears to his third Indy 500 victory. The “kOOLest” part about this row of Indy winner’s was that these four race car chassis bodywork were removed and hanging above each racecar respectively. As it’s always amazing to look at how these missiles are packaged so compactly! Directly across from these four cars is the museum’s main entrance, with receptionist desk and three more chassis facing inwards. The woman who’d earlier “scolded us” asked if we’d like to sign the guest register while offering us brochures. A man decorating a large Christmas tree “chimed-in,” asking: Where are you from and how did you hear about the museum? I replied that I’d seen Mr. Penske being interviewed on Wind Tunnel with Dave Despain from this museum. Yes, the receptionist said: He sat right there at the end of the museum in front of the Miller Lite car. Moving along towards the three racecars beckoning our attention, quite amazing was the stark contrast between the 1974 Penske PC-1 Formula 1 chassis and the 1977 Penske PC-5 Indycar, parked side by side. The F1 chassis utilized much smaller diameter, wider width tyres compared with the Indycar. Mark Donohue & John Watson drove this F1 chassis, as sadly Donohue died from accident injuries incurred while piloting a Penske F1 car in 1974. 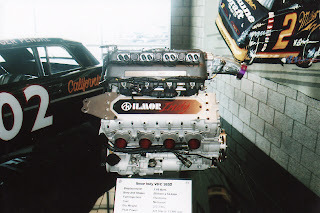 In the middle was the “Hertz-Doughnut” yellow Cummins Diesel 1987 March 86C piloted by “Big Al” (Al Unser Sr.) to his record tying 4th Indy 500 victory. Interestingly the car had been a show car prior to the “Month of May,” hence being a year old chassis, with the second Bad Habits car filling out the row. The final row of four vehicles was a mixed euphoria, which seems to mirror the current state of open wheel racing. I found myself mesmerized by the beautiful red & white non-Marlboro liveried #68 Dallara IRL chassis. Perhaps it was the side view profile? Or the fact that this car seemed to closely mimic the style of today’s current F1 designs? Alongside the #68 was the now full Marlboro liveried Dallara also piloted by ‘Hulio Castro-nervous, who drove both Penske Bad Habits cars to consecutive victories in 2001-02.The final race car was the 2003 G-Force driven to victory by Gil de Ferran, garnering Toyota’s first Borg-Warner trophy. What a really “kOOL” sight to see three BAD HABITZ chassis parked together! As I was highly tempted to have Miguel snap an “ILLEGAL” picture of three IRL cars… (Am I LOSING my mind, eh?) Looking absolutely LOST and out of place was the 2003 ‘Chebbie SSR Pace truck at the end of the row. What an absolute WASTE of display space! Alongside the Sunoco McLaren was the corresponding 1972 Hurst/Olds Cutlass Pace car and a 40% wind tunnel Marlboro Penske Indycar. Securely tucked against the wall was a mammoth Vanderbilt Cup trophy engraved with 2000-01 Champion Gil de Ferran. (CART Driver’s Champion) Further along the wall was a Honda “ChumpCarzs” valve cover in recognition of Penske’s 100th Champ Car victory. Also for sale were two Carousel 1/18 diecasts... The newly released 1972 Sunoco Donohue: $140.00; 1-of-3,600 pieces, (My latest acquisition) and a 1976 Cam2 red McLaren hand-signed Mario Andretti for $120.00. The Captain wrangled Emerson Fittipaldi along with the Marlboro ssponsorship away from Pat Patrick in 1990 as Penske Racing scored three more Bad Habitz speedway victories including Marlboro’s final CART Indy 500 victory in 1994. Al Unser Jr. triumphed from pole. Going “From Hero to Zero,” Penske’s team was unable to qualify his cars the following year. 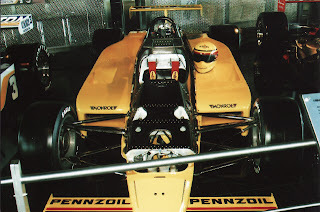 Yet having sat out five runnings of Indy as a loyal CART owner, Penske returned in 2001 with Non-Marlboro liveried chassis before becoming the first major CART ‘Domo (owner) to jump ship full time to the rival Indy Racing League. In late 2004 A Penske “penned” Editorial appeared in a prominent East coast newspaper pleading for the reunification of the two rival leagues. Vainly trying to bring “The Split” full-circle, Penske’s effort failed as the two sides seem determined to stay at loggerheads, as ironically Roger was instrumental in forming CART in 1979. Watching Penske’s interview on Wind Tunnel, (some six-plus years ago) I chuckled to myself over how impressed I was by “The Captain,” noting how much of a class act he was and how business ALWAYS comes first. And on my final day of vacation, after mondo burritos for lunch at Chupatas with Miguel, I found myself back at the museum once again, picking up a few extra brochures. (Which I thought I’d do something clever with - like may be framing ‘Juan?) Of course another “walk-about” was mandatory. This time I noticed that every Indycar had the respective driver’s helmet sitting on the left-hand sidepod. Also noted was the severe “lowness” of the Penske PC-20. This chassis had the lowest ground clearance of all the Indy cars present. It appeared to have approx. one-inch ground clearance from the nose to the start of the cockpit before transitioning to two-inches approx. Once again talking to the museum’s staff, my “eagle-eyed” brother inquired; where is the Donohue Porsche RSR IROC car shown in the brochure? To which we were informed that the car had just left last week when the Sneva car arrived after its restoration... It’s currently being displayed in the new ALMS shop. Once again, Miguel commented how it just didn’t feel right to be climbing back into his “daily driver.” Look, they moved the Ferrari. (F430) Asking is that the same black Lamborghini we saw yesterday? Yeah, it must be... Look at that car, it’s freaking AWESOME! I was TOTALLY blown away by this AWESOME museum nestled inside the LARGEST MEGA Auto dealership I’ve ever been too - with the museum exuding typical Penske perfection. The funniest part of my first two visits before flying home was that after my sentimental favourite (the 1972 Sunoco Donohue McLaren) I could NOT quit marveling, gawking and commenting how AWESOME the 2001 Dallara IRL chassis looked... SHEISA!!! The Open-Wheel Feud looks set to continue once again with a new wrinkle. PKV & Rocketsports Racing have both tested Katherine Legge in winter tests at Sebring recently. Legge, whom unlike Danica Patrick, WON a race last year in Toyota Atlantic’s…Look for the “Battle of the Sexes” to heat up when the “Cheeky Brit” Katherine takes on Danica. Can you say “Cat-Fight - Meow...? This is the list of vehicles I noted whilst making my debutant visit to The Captain’s Cathedral ‘O Speed - which the vehicles on display has changed over the years since, albeit the Indy Cars, Formula 1 & engines remain the same - their locations do tend to change..